You have reached our 2012 glamping blog however don't worry we have a brand new blog full of glamping adventure ideas in Northern Ireland for 2014. If you’re planning to spend your summer holidays at home or fancy a weekend away with your mates then glamorous camping in Northern Ireland is a must! Let’s be honest we don't always have the best summers but there’s no point complaining about it, it's time to get outside and make the most of the great outdoors! Thankfully a new phenomenon is here to save the day; ‘Glamping' or glamorous camping combines camping with some of the amenities of a home/hotel so you can now enjoy the tranquillity of the outdoors with the added bonus of staying dry. No longer do you have to waste time struggling to put up a tent in the wind and rain, leaving you with more time to enjoy the fantastic outdoor activities Northern Ireland has to offer. With loads of outdoor activity providers located beside the glamping sites you can forget the cards and scrabble and get ready to have some real fun! 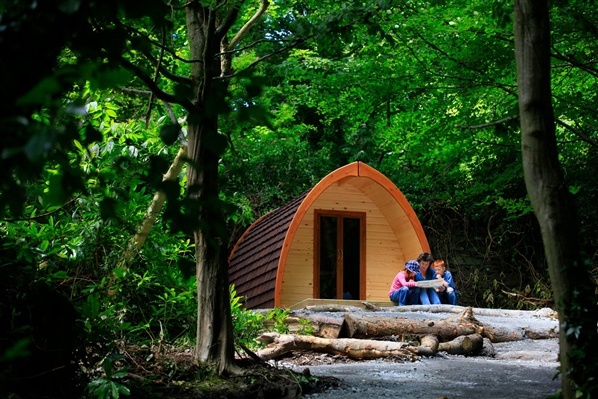 So whether you’re looking to have some craic with your mates or spend some quality time with the family a glamping adventure break in Northern Ireland is the perfect choice. Tucked away in the stunning 820 acre demesne Castle Ward has four eco friendly continental camping pods for you to enjoy. Choose between the standard or family pod accommodating 2 adults and 1 child or 2 adults and 3 children respectively. With lockable French doors designed to cut down the noise of heavy rain, you can get a good nights sleep whatever the weather! 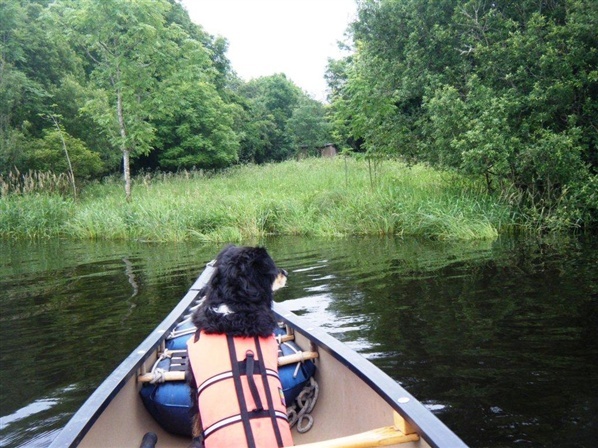 Located within the grounds of Castle Ward is Clearsky Adventure Centre where you can find everything you need to enjoy the miles of multipurpose trails including bike hire and canoe hire so exploring the Strangford lough Canoe Trail won't be a problem. Ever fancied staying in a Jungle? 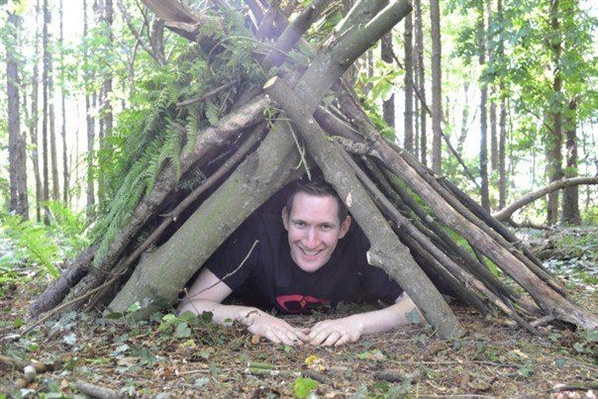 Head down to the Jungle NI in Magherafelt and you can stay in one of their Jungle huts without having to worry about poisonous snakes or deadly spiders! Set in the heart of their tranquil forest these purpose built huts sleep up to 8 people and are double-glazed, secure and lockable, so you are guaranteed to be cosy and warm whatever the weather. If you really want to glamp it up after a day of outdoor activities then you can relax and unwind in their outdoor hotubs! Whilst staying at The Jungle NI you are guaranteed not to be bored. Separate your friends from your enemies with a paintball session – just don’t forget who you’re sharing a hut with! 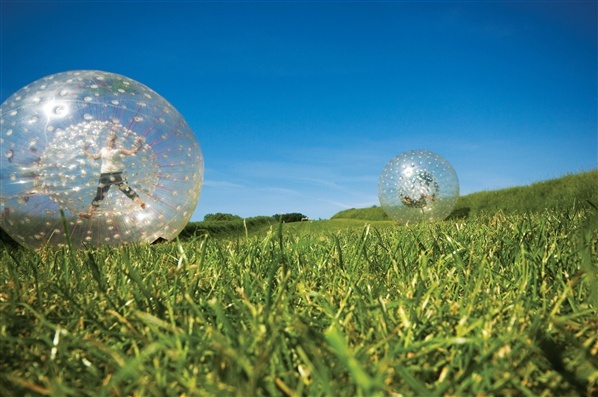 Release your inner tarzan or Jane on their tree top adventure course, get down and dirty on an off road Segway or hurtle down a hill at high speeds in their zorbing balls. Carrowmena Activity Centre has recently welcomed two new eco-friendly camping cocoons to their site in the Binevenagh Area of Outstanding Natural Beauty. With room for up to 6 people and picnic tables for that al fresco dining experience this is a great way to enjoy the outdoors in style. Facilities onsite also include a BBQ and camp fire – just because you’re not in a tent doesn’t mean you have to miss out on the toasted marshallows! 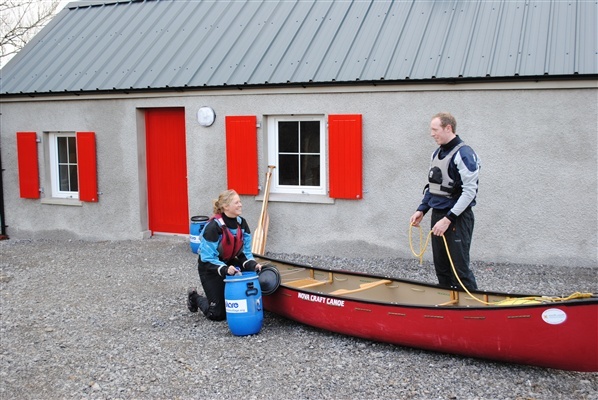 Carrowmena activity centre offers a variety of land and water activities so you won’t have to stray too far to find an adventure! Have a go at archery, scale their climbing tower, zoom down the zipline or take to the water for a spot of canoe or kayaking. 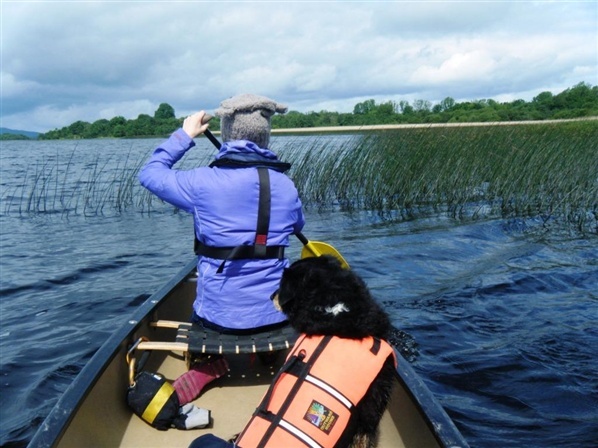 Trannish Island is a large island on Upper Lough Erne which is a great base to start from on a short mini adventure break around Upper Lough Erne. The island has an old stone cottage that has recently been totally revamped. With a cosy wood burning stove, toilets, showers and camping platforms to sleep on, this is definitely a bit more luxurious than your average camp site. 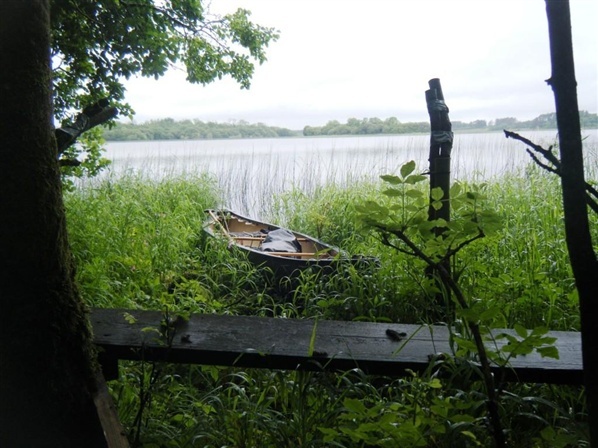 This haven produces a relaxing atmosphere away from other distractions to read a good book, practice photography or develop a work of art or you can use it as a stopover point to BBQ and enjoy a few beers after a hard days paddling when exploring the Lough Erne Canoe Trail. 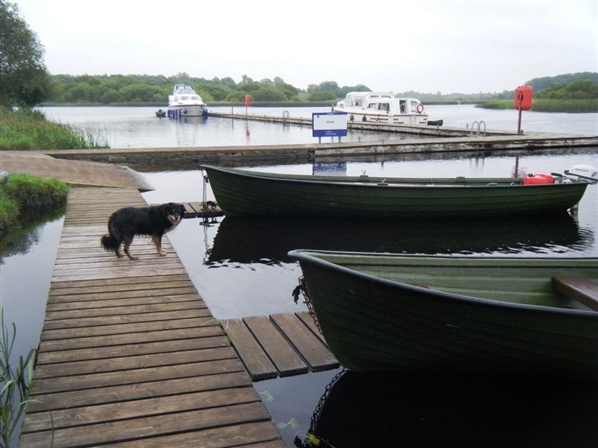 Situated just a paddle away is Ireland’s largest multi-activity centre; Share Discovery Village , where you can hire a range of canoes or kayaks to access the island or take part in one of their many exciting outdoor activities available throughout the year . 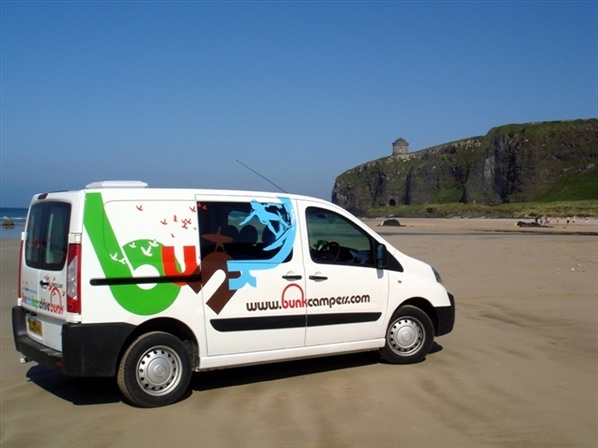 If you can’t decide where to go then why not hire a campervan and create your own adventure? Bunk campers provide campervan rental for families, couples and groups of friends looking for an action packed, enjoyable short break experience. There are a range of campervans which come with fully functional heating, cooking facilities, iPod connectivity, converted bed space and in some cases even shower and toilet facilities. Head to the North Coast for a spot of surfing or go wet bouldering, rock climbing or walking in the Mournes. Check out the Northern Ireland Tourist Board, Forest Service and The National Trust for an extensive list of campsites and your short break itinerary is sorted. 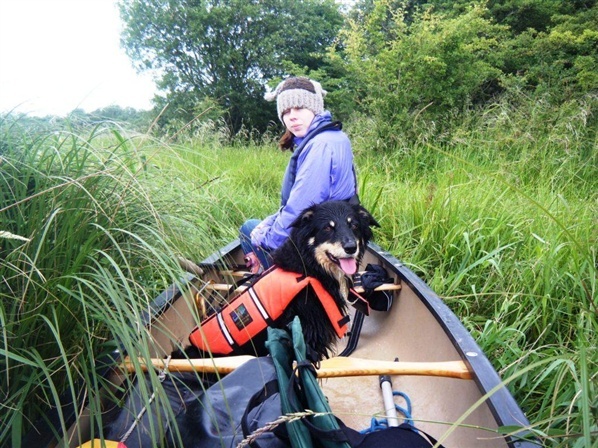 Sarah joined the marketing team of Outdoor Recreation NI in 2011. A firm believer in giving anything a go at least once (unless it involves jumping out of a plane at 6,000ft!) she is always looking for new adventures in the outdoors and can often be found wandering the Mournes or Glens of Antrim attempting not to get lost! 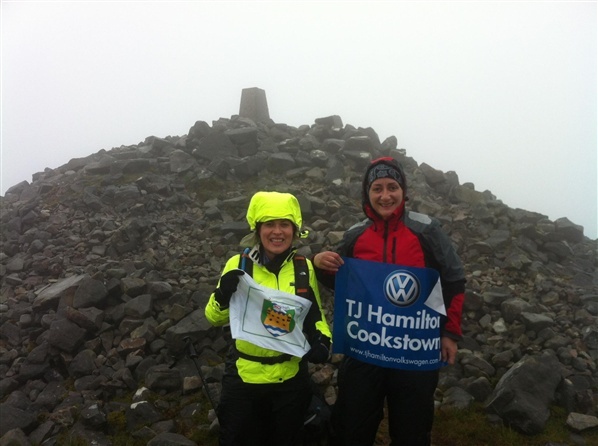 On the 23rd June 2012 Emma McCann and Pauline McGurk took on not one but six of the highest mountains in Northern Ireland in a unique fundraiser for Cancer Focus Northern Ireland. 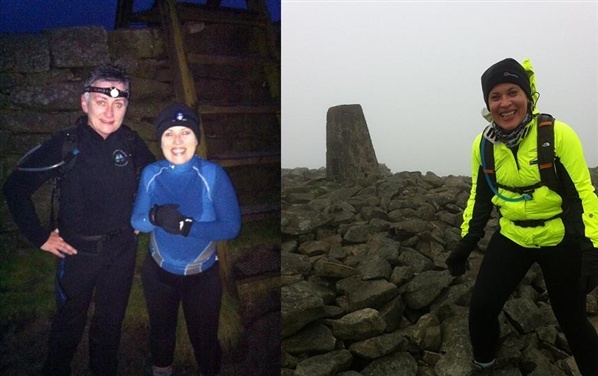 The intrepid pair certainly lived up to the challenge travelling across all six counties to reach the peaks of Slieve Donard in Co Down (850m), Slieve Gullion in Co Armagh (573m), Cuilcagh in Co Fermanagh (666m), Trostan in Co Antrim (550m), Sawel in Co Derry (678m) and Mullaghcarn in Co Tyrone (542) in just 24hrs. 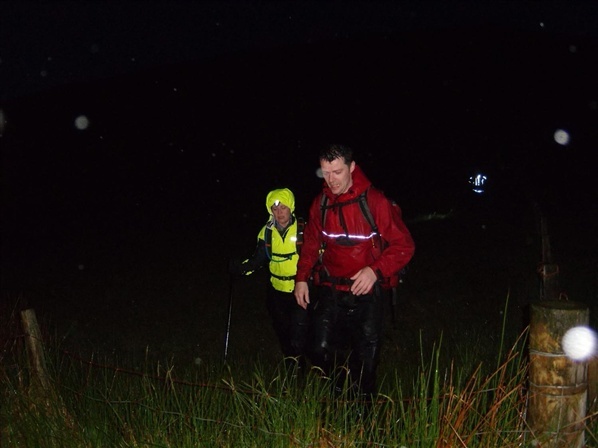 Emma McCann has kindly written a guest blog for WalkNI.com on her highs and lows – both physical and mental during this inspirational challenge. It’s the early hours of 23rd June and the wind is howling around the Slieve Donard Hotel. Looking into the blackness, it’s hard to imagine that we will be out there in just 2 hours; heading up the first of 6 mountains to be climbed that day. Starting out on Donard at 3am heightened all our senses, especially our hearing. So much so that a donkey braying shook us from the surreal world we were entering from Bloody Bridge. Having a pathfinder with us was reassuring and distracting and, with conversation flowing, the time passes quickly. We soon reach The Saddle and the Mourne Wall. This can be difficult at the best of times but here it acted as a windbreak for the 40mph gusts we experienced. Cold and wet we reached the summit, but there was little time for photos as visibility was poor and the conditions were worsening. The wind blew the mist into our faces so hard that it felt like sand. Heading down was slow going but the dawn light and Molly the Search & Rescue dog lifted our spirits. Back at our support vehicle we were heartened that we were ahead of schedule. Climbing Slieve Donard (left) and reaching the summit of Slieve Gullion. Porridge in the back of the car was welcome as we set off for Slieve Gullion in Co. Armagh. This Mountain was the only dry ascent we had, though visibility was very poor. Once again we scrambled up and down and made up valuable time. We were flying as we set out on the 2 ½ hour drive to Cuilcagh Mountain in Co Fermanagh. Cuilcagh looked like it was beckoning us into Middle Earth’s Mordor. Rain, wind and mist became our companions. On and on, up and up, the rain relentless. We could only imagine how beautiful this summit must be on a clear day. The first feelings of wet socks were worrying as 3 more mountains waited to unleash their wrath on us. Stew, dry clothes and a 3 hour drive to Co. Antrim served us well. Refuelling en-route and picking up more support team we reached Trostan. It wasn’t raining! However, a swollen river needed to be navigated twice to proceed. The ascent here was slow and steady but at least it wasn’t raining - for now! 300 yards from the car and Trostan or some other celestial being decided we hadn’t suffered enough: the skies opened and the deluge soaked us again. But on the bright side, we had made up time again! Onwards to the Sperrins. More pathfinders and support team provide motivation and soup. Journeying through the Glenelly Valley we couldn’t see the splendour of Sawel Mountain but knew it was there, somewhere. Number 5 was wet, zero visibility and despite being the Summer Solstice, it was getting unseasonably dark early. Spurned on by everyone we dug deep and made it up and down though we lost some time here. Spirits were low but the determination was high. Yet another set of dry clothes and we were on our way to our final climb: Mullaghcarn Mountain Co. Tyrone. Tired and wet we made the summit at 12.28am. The 6 Peaks of the 6 Counties threw everything at us on the 23rd June 2012 but we chewed it up, spat it out and fought back to show that we were indeed, ‘Ladies with Altitude’. Emma McCann took to hiking relatively recently when she decided to prepare for a charityTrek to Peru. From then on in, she was hooked. Using her skills gained in advertising and sales, she has become a seasoned fundraiser for various charities including, the Pancreatic Cancer Research Fund, Cancer Focus NI and was the first female member and subsequent Female President of Cookstown & Magherafelt Lions Club. Emma likes nothing more than getting into the Sperrin Mountains where she lives with her husband John and considers herself so lucky to live in one of the walking gems of Ireland. Emma and John enjoy walking in Europe and hope to continue this for years to come. 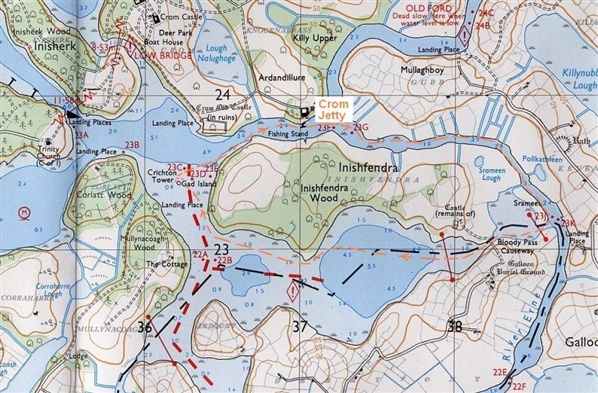 Keen canoeist Nick Wolsey has almost completed his self made quest to land on every island on Strangford Lough. 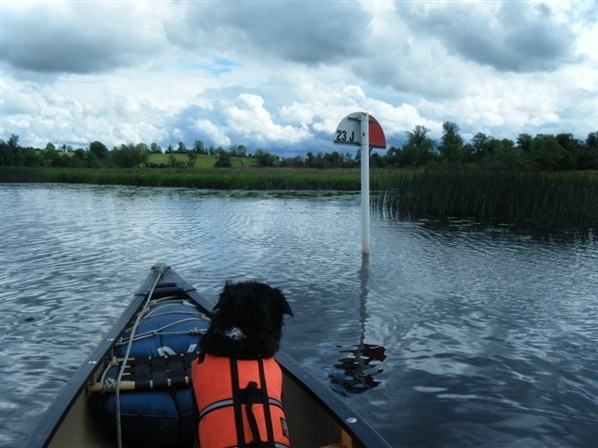 Not content with this he has already embarked on a second challenge to circumnavigate every island on Lough Erne. This is no small task considering it is rumoured there are 365!! Nick has kindly written a guest blog for CanoeNI.com on his account of the first steps (or paddle stokes) of this challenge. 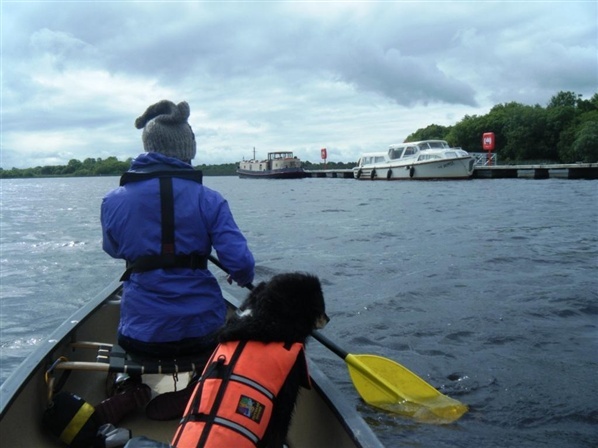 On the last Saturday in June my daughter Melissa, faithful hound Molly and I set off for Carrybridge on the River Erne for the first full trial of the Mothership concept. (thanks Mary in Oxford for the name.) We arrived at 8pm and stayed the night at our normal dock. First thing in the morning we were up and away, heading south to Naan Island. Mobile Bothy set up at the Naan Island jetty by 9am. We planned to base ourselves here and explore the surrounding islands by canoe. I managed three trips from here, on the first trip up to Sunday lunchtime I was accompanied by my daughter, then the afternoon trip and Monday morning trips it was just me and my hound. We set off north into wind with the intention of circumnavigating Naan Island. As we reached the north end of the island we were exposed to a stiff northwest wind and decided to turn back as the waves were uncomfortable. We then headed for the sheltered south end of the island. We skirted the reed beds connecting Naan West with Naan South and found a grassy area to land for an early lunch break. The water lever was a foot higher than normal and we could paddle right into the long grass. Naan Island South picnic site. We spotted a bird nestbox made from wire mesh and straw, it was not inhabited. In the afternoon the wind had died down and swung round to the southwest, at about 3pm while my daughter had a snooze in the Bothy I set off southeast to explore Mountjoy Island. It had a small area of grass as a picnic/camping area with a garden shed containing a plastic table and chairs. Heading round the island the rest of it was overgrown and impossible to land on, the reed beds were very peaceful and eventually I backed into the reeds for a teabreak, Molly was not amused at not getting out to explore. I headed into wind partly sheltered by Creaghananure Island then turned northwest back to base. In the morning the wind had swung round to the southeast so I set off with Molly (teenagers don’t do mornings !) 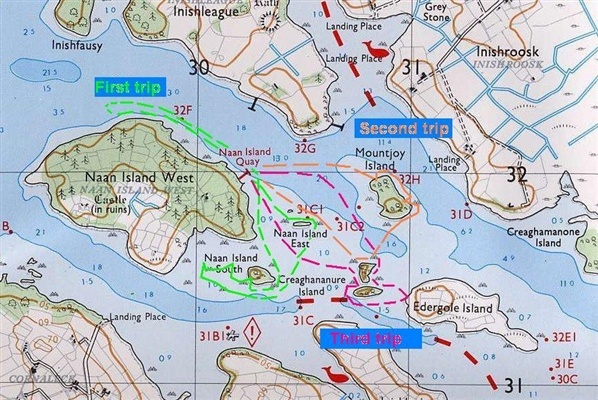 to explore Creaghananure Island. 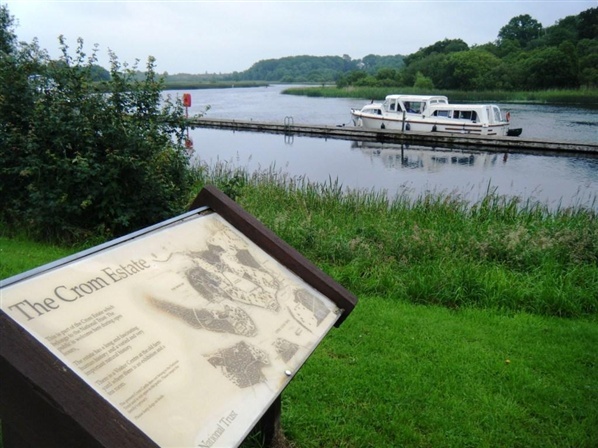 Like most of the small islands on Lough Erne most of this island was impenetrable due to dense undergrowth overhanging the water, but the south end was clear under the trees and looked as if it may have been a historic defensive position. Someone has provided a long bench seat with a great view. As I explored the interior I disturbed some sizable beast which went crashing and then splashing towards the north part of the island. Then as I made my way back to the boat I came across a completely stripped and dismantled skeleton of something sheep sized, this was laid out in order of dismantlement implying non human consumption, at this point a shiver went down my spine and I hopped into my boat and left sharpish ! It was probably just the two swans I saw later that made the crashing noise, probably ! Funny how your mind plays tricks when you are on your own, with just an overfriendly hound for protection. I then paddled over to Edergole Island as the furthest point of the trip. The run back to the jetty was downwind so I fitted up the sail ready for use, but first I paddled back across to the bay on the southeast side of Creaghananure and here experienced an epiphany. 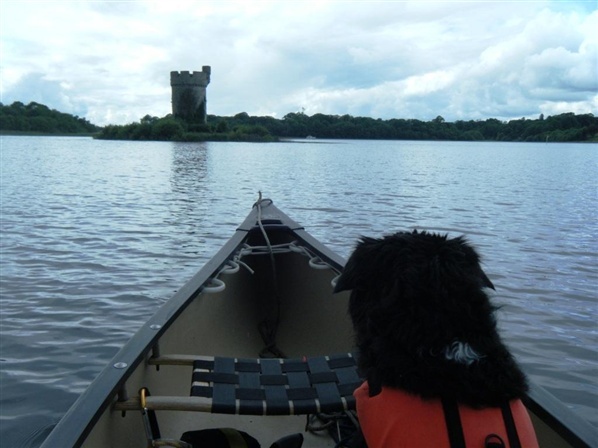 I came to the realisation that this is the only way to fully experience the beauty of Lough Erne. 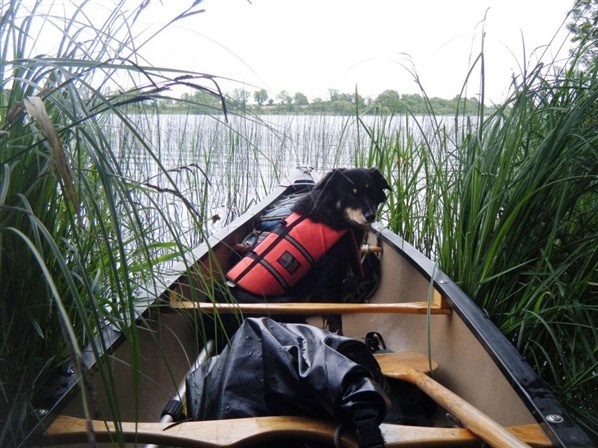 In a small boat, no engine, in the reeds with the swans and coots, close to an overgrown island untouched by man, with a faithful hound for company. This was brought into sharp focus by the contrast with the big boat waiting with its home comforts at the jetty. 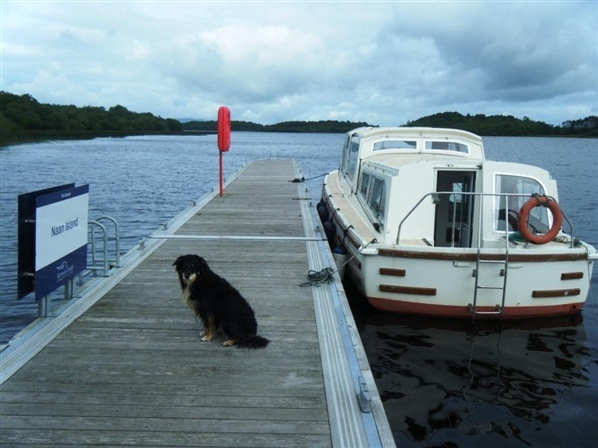 The cruiser is useless for appreciating the lough, it can only access about 10% of the lough and is severely restricted as to where you can stop ( I have yet to try the anchor ). It is like watching the lough from a distance through a television screen. It is noisy, smelly and intrusive, but I love the convenience, not have to set up camp and then pack up in the morning. The Mothership concept works and I have the best of both worlds. The last part of the trip was by sail with a gentle tailwind. By the time I got back to the big boat my daughter was up and wanted to head south to Crom. We cast off and motored south, reaching Crom by lunchtime. After lunch we had a long walk to tire out the dog and the daughter, then at 3pm I set off on a mission to check out Bloody Pass. This is an expedition I have wanted to do for some time to see if it is possible to paddle all the way round Inishfendra island. A causeway has been built at Bloody Pass and the rumour is that it is impassable. I set off up river into the wind, it was hard work, but the concept was that if the Pass was impassable at least I could drift back down river with the wind. On the chart the turn-in is marked with post 23J. Across a stretch of open water we came to a choked up channel leading to the causeway. Because the river level was a foot higher than normal it was possible to push through the reeds right up to the causeway, but if the level was lower than normal it would leave a marshy area that would be hard to portage. 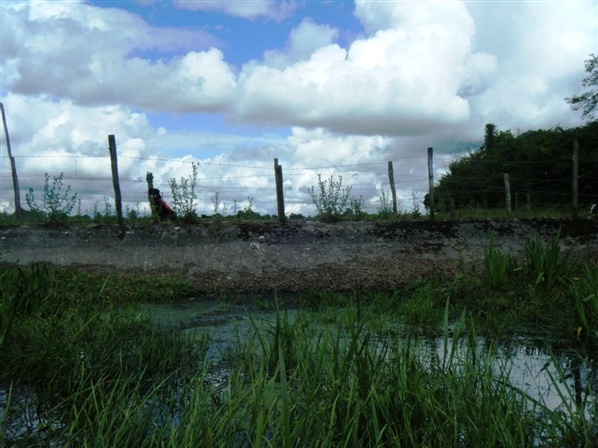 The causeway had a barbed wire fence with an electric strand on top, but at one end there was a gap where the wire strands could be unhooked and the boat passed through. On both sides of the causeway the cows had churned up the ground and left their usual deposits making the going heavy. At last I made it into the open lough south of Inishfendra, and a gentle tailwind blew me back towards the Crom junction. After half an hour of gentle paddling Gad Island with Crichton Tower came into view. 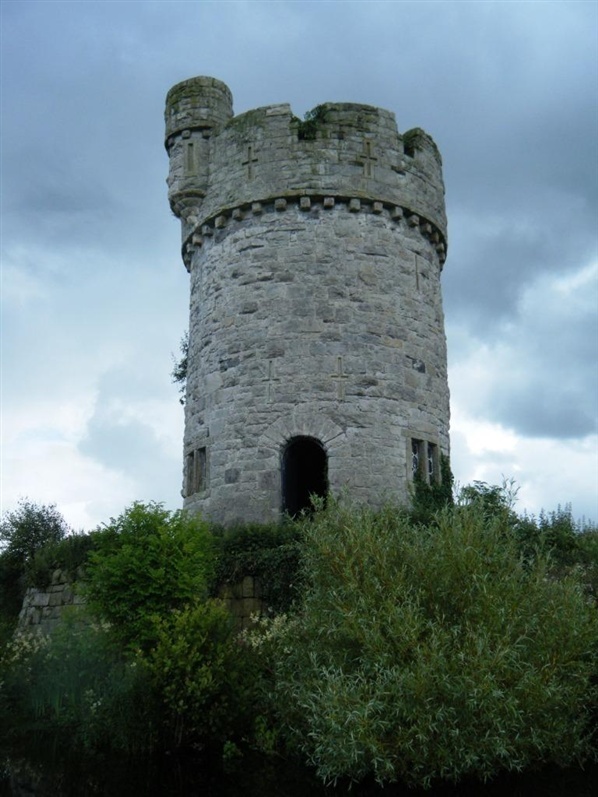 Crichton Tower is a folly built to give a focal point to look at from the main Crom Castle. The door was open so I landed and had a look, the ground floor has a domed roof with a hole in the centre for a ladder. The upper floor has no roof, and no access to the battlements. A little disappointing. Time to head back to the Crom Dock, I had no watch and thought I might have been out longer than expected, but when I got back to the big boat I found the whole trip had taken just two hours. The river level is still rising. No canoeing on the Tuesday, damp and windy. We motored back to the Noble Dock, stopping for lunch at Knockninny. The Mothership/Canoe combination works very well, the amount of canoeing dependant on the weather and the patience of those with you. Must arrange to bring a canoe enthusiast with me next time, or maybe just Molly. By day Nick Wolsey is a technical instructor with Shorts/Bombardier which involves a lot of worldwide travel. 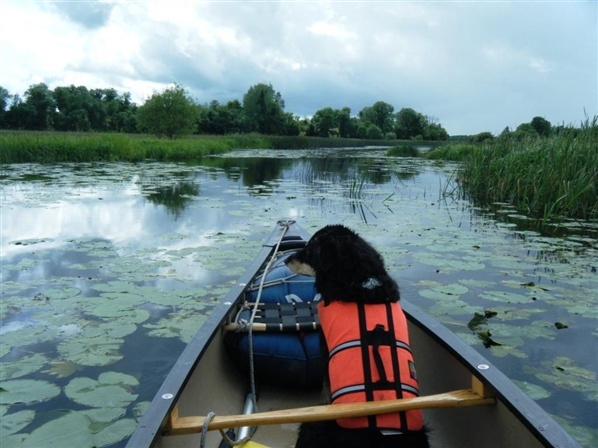 As such he likes to spend his spare leisure time enjoying canoeing at home in Ireland. Nick has almost completed a self made quest to land on every island on Strangford Lough. 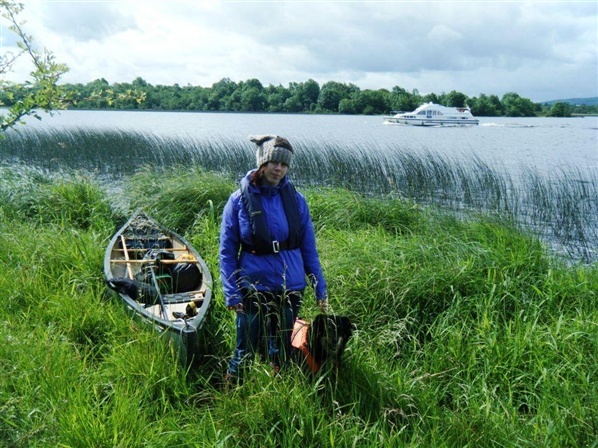 This quest has developed further to paddle around all of the islands on Lough Erne. Nick is also a Volunteer Canoe Ranger assisting CanoeNI.com regularly inspect the canoe trails. OutdoorNI.com does Bushcraft is the latest in our regular blog feature ‘OutdoorNI.com does…’ which is our opportunity to showcase the exciting outdoor activities available in Northern Ireland. 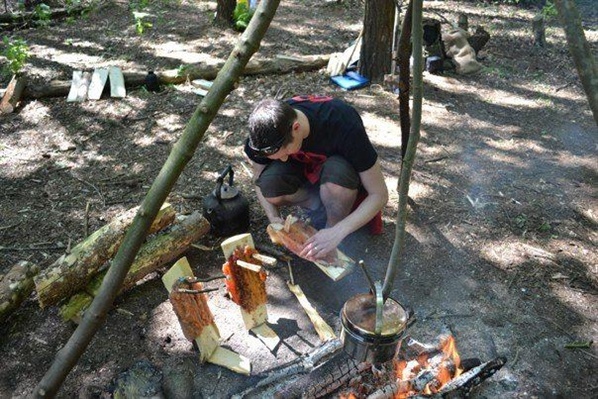 Having spent my teenage years in the scouts I consider myself to be reasonably handy in the outdoor environment, however the recent advent of bushcraft ‘celebrities’ such as Ray Mears and Bear Grylls has brought survival skills to a whole new level. I left for Galgorm Castle Estate near Ballymena excited about learning a range of new skills which I would hopefully be able to put to future use. On arrival I was greeted by Paul and Andy from Northern Ireland Survival School who led me through the undergrowth into a forest clearing which with shelters, fire bases and improvised seating looked like a set from Robin Hood. My fellow course participants were an eclectic bunch including a father and son pairing and a PhD student, which highlighted straight away the wide range of folk interested in this growing activity. Given the course included fire lighting and a lot of knife work, Paul set our minds at ease with a safety talk which was reinforced throughout the day. Before long we were set our first task of lighting a fire with one match, so needless to say that without a ‘Sunny Jim’ in sight this wasn’t very successful and resulted in singed fingers, a broken match, dented pride and clearly a lot to learn. After a short demonstration by Paul we were quickly working as a team to create feathered kindle sticks, collect graded kindling (small pieces of wood), and larger pieces of wood. Within twenty minutes we had a roaring fire which was ignited by a solitary match. With our confidence boosted, we were ready for our next task and my favourite of the day – preparation of lunch. Andy took us on a foraging walk to collect the ingredients; his knowledge of plants and trees was amazing. As we walked we nibbled on plants with a range of flavours including citrus, mint and wild garlic. He also pointed out those with natural antibiotic properties such as penicillin which is a derivative of willow. As tasty as the various plants were I was getting a bit concerned that this was going to be the extent of my lunch and was beginning to panic how I would survive in Galgorm Castle Estate until dinner never mind any prolonged period in the wild. Much to my relief Paul produced some beautiful line caught brown trout and in true bushcraft style taught us how to fillet them with a sharpened flint. With plenty of care and attention I removed the internal organs, head and tail whilst ensuring as much flesh as possible remained for my hungry belly. Andy explained the guts could be used to make a nice soup – suddenly my belly was not just as hungry and I declined his offer. As I placed my fish next to the fire to cook, I couldn’t help thinking how I would use this technique again in every day life rather than buying farmed fish from the fish counter at the local supermarket. This was further heightened when I took my first bite. 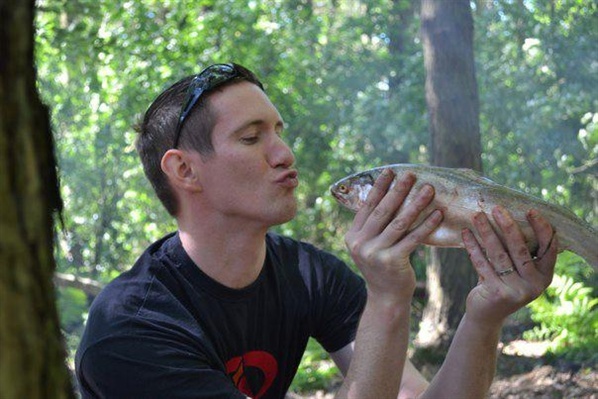 I don’t whether it was because of the effort I had put in to prepare the fish or due to the combination flavours of wood smoke and open fire cooking but this was certainly the best fish I had ever tasted. Appetite satisfied the remainder of the afternoon was spent learning how to build an effective shelter. We split into two groups and I could see the anguish on my team mate’s face as we set about building a shelter to fit my 6ft4in frame. Under the guidance and assistance of Andy we used dead wood and ferns to create a one man shelter which resembled a cocoon like sleeping bag but none the less a comfortable bed for the night if required. All too soon the day had come to an end with the presentation of certificates. The group and I had fed of Andy & Paul’s passion, enthusiasm and knowledge all day and certainly left as bona fide bushcraft enthusiasts looking forward to putting our new found skills into action. It would be naïve to say I had learnt it all in one day so I’ll look forward to signing up to one of the wide range of further courses available. 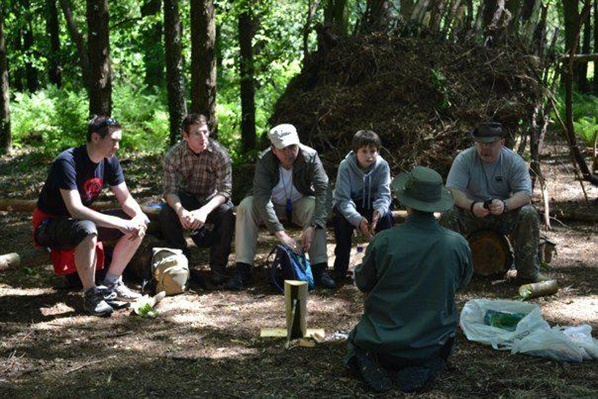 This was a taster course designed to feed your curiosity in bushcraft and make your interest grow. When not boring everyone about his little kids’ latest antics, Chris enjoys sailing and cycling, if only to offset his love of eating out and Marlborough Cabernet Sauvignon..
Botanic Gardens: located in central Belfast beside the Ulster Museum, this circular walk is beautiful, scenic and less than 1 mile long. The area features a Rose Garden, Tropical Ravine and Palm House. Divis Mountain Lough Trail: Get some mountain air in your lungs! The Divis Mountain Lough Trail was specifically designed for people with limited mobility and is a gentle circular route that leads you across the open hill on a wide, flat and gently sloping path. Lough Neagh, the Sperrins and further a field can be viewed on a clear day. Oxford Island: This trail takes in the Oxford Island National Nature Reserve and is a haven for wildlife. 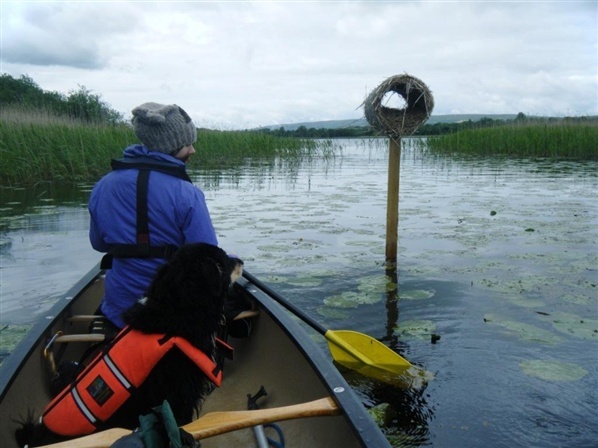 Visitors can explore a range of habitats from woodlands to reedbeds. There are 2 Shop Mobility scooters available for free use to those with limited mobility capable of using them. Booking is advised. 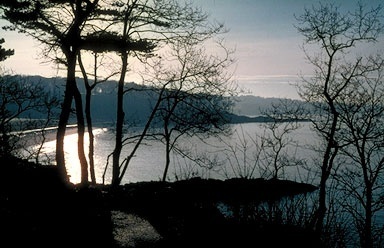 Crawsfordsburn Country Park Coastal Rambles: Beautiful rambles in a superb setting overlooking Belfast Lough. Allow a whole morning or afternoon. Florencecourt Forest Park, Lady’s Well Walk: A short gentle walk skirting the parkland in front of the mansion house, passing the Lady's Well and meandering through varying ages of broadleaved woodland before returning to the car park. 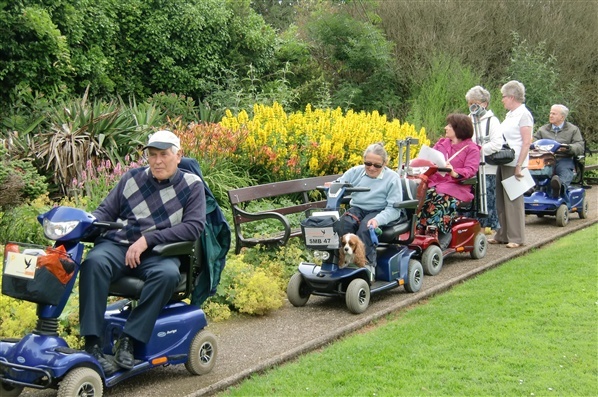 This walk is suitable for the elderly and less able visitors. Springhill House Walk: A circular walk through Springhill Estate visits the gardens, Springhill House, estate walk and Demesne. Claire has been has been in the Outdoor Recreation NI team since 2010. 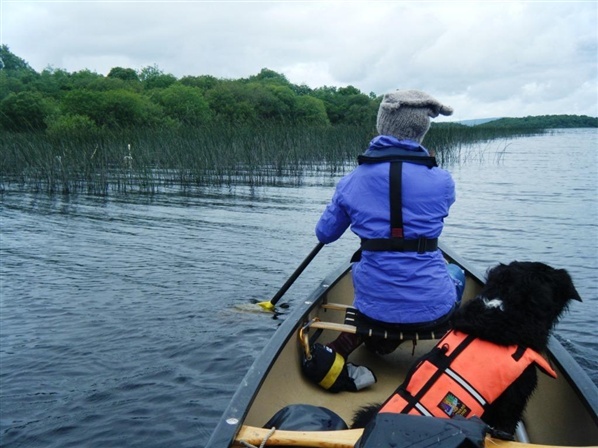 As Development Officer for the Venture Outdoors Project she is responsible for creating opportunities for those from disabled, minority ethnic and socially disadvantaged communities to enjoy Northern Ireland's outdoors. Claire is a keen mountain biker and snow sports enthusiast.